This site contains a computer recostruction of Ostia, the ancient harbour of Rome. 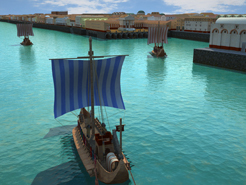 I started working on this project on 2001, when I have modeled a portion of the town for the exhibition ‘Ostia, Port de la Rome Antique’, held in Geneva from 23 February to 22 July 2001. After the ending of the exhibition, I have decided to finish the work and to model the whole town. I have spent lot of time to find plans, documents, drawing and images for my work. I visited the archeological site, one of the most important in Italy, after Rome and Pompei, to collect images, measures, number and feeling. I have used the pictures taken on site to produce dozen of seamless textures that I have applied to my monuments: bricks, plaster, marble for columns, stones of road, mosaic, floors, even the sand on the beach, or pictures of the sky, with its awesome shades of blue that you can see only in that place of Italy. As I walked along the antique streets of the site, for hours, a vision of the ancient town started to emerge in my mind, with its colours, its building, its Temples, its Domus, its Horreas. 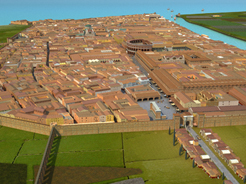 The computer graphic images published in this site represent a personal interpretation of this unique Roman site. NEW! – On July 2016 I have added a section dedicated to the VR Panoramas. Using a plugin for Lightwave called Ubercam, I can generate full 360 degrees panoramas of the town. These images can be viewed on the screen or via a smartphone, or even with VR headset like Gear or Oculus. Enjoy the VR Visit!